Last week my brother-in-law got 2 boxes i.e. 2 dozen of Alphonso Mangoes, naturally ripened. The mangoes were so sweet with the perfect yellow colour that I decided to use them for something interesting. 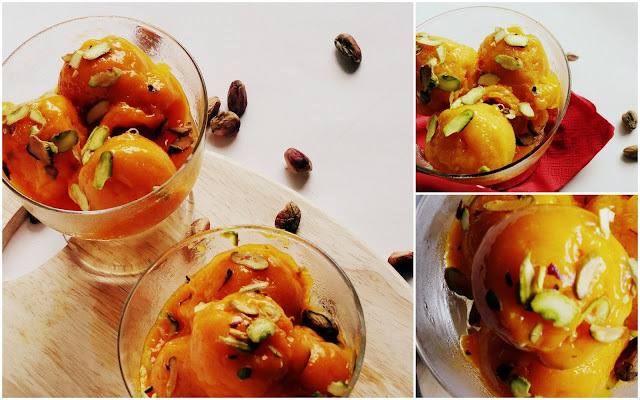 I thought of making some sorbet to combat the heat we have been witnessing as the summer is at its peak and we were all desperately waiting for the monsoon to hit. They don't say Mango is the King of all the fruits for nothing. This fruit has every reason to be the favourite among all the fruits. Look at the colour, the texture or the sweet taste of the fruit and anybody would fall for it. This sorbet allows you to enjoy the low fat version of a dessert and gives you a reason to smile happily in this scorching heat of Mumbai. And that the recipe is vegan, is a bonus! In a saucepan, heat sugar and water until the sugar completely dissolves. Remove it from heat and let it cool completely at room temperature. Peel the mangoes and cut the flesh away from the pit. Squeeze the mango pits hard over the blender to extract as much of the pulp and juice as possible. Cut the flesh into chunks and put them in a blender with the cooled sugar syrup, lime juice and rum. Taste, then add more lime juice or rum if desired. Chill the mixture thoroughly, then freeze it in your ice cream maker according to the manufacturer’s instructions. 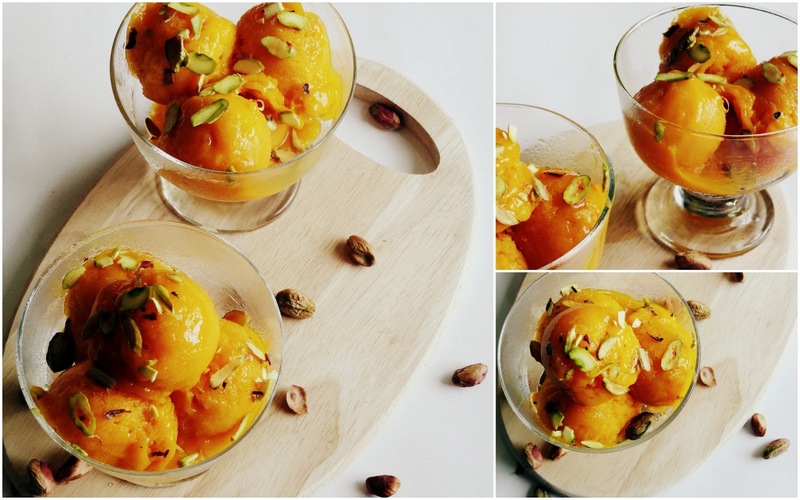 Once sorbet is made, transfer into a freezer box, cover, and freeze. Pour the mixture into a stainless steel pan (sorbets will freeze faster in stainless steel), cover with plastic wrap, and place in the freezer. When the sorbet is completely frozen (3 to 4 hours), remove from freezer and let stand at room temperature until partially thawed. Place the sorbet back into the pan and refreeze for at least three hours, and up to several days. Hope you would also like making this as much as I did!